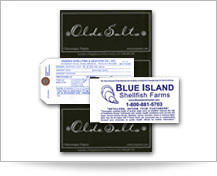 Allen-Bailey Tag and Label has been directly involved with the shellfish market for 40+ years. In fact, we have been at the forefront of this market from its inception and designed the still-used standard format for shellfish tags. The purpose of shellfish tags and labels remains as it was at the start, to identify the source of the shellfish and the length of time from harvest to market. Additional harvest information may be included such as the date and temperature of the water. 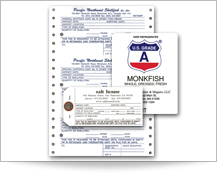 This information is recorded by hand on something as simple as a ganged DuPont™ Tyvek® tag, up to and including pinfed style for dot matrix imprinting, thermal transfer, and laser imprinted tags. Allen-Bailey seeks to help our shellfish customers widen their brand recognition. See some other products we make for the shellfish market on our Marketing Opportunities page. With the Food Safety Modernization Act of 2010, the FDA tightened the traceability requirements for all shellfish products, therefore requiring ever increasing types of information to be recorded and retained with the product. 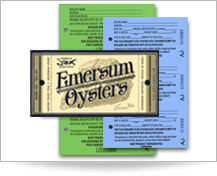 As the identification must remain with the shellfish until the bag or bin is emptied, our tags and labels are designed to withstand exposures to outdoor environments. They can also be exposed to water with no degradation of information. 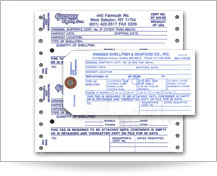 Let Allen-Bailey help you comply with regulations and maintain an efficient operation by providing you with your tag and label needs. We have experience designing tags in compliance with industry regulations while continuing to provide the branding desired by our customers. For additional information on traceability, see our Traceability page. The most common method of attaching shellfish tags to bags or bins of products is with a 16 ga. Galvanized wire diamond deadlock, which we can and do provide with each order. Other fastener options include parcel hooks, UV resistant cable ties, and 12” double wire attachments. © Copyright 2019, Allen-Bailey Tag & Label, All rights reserved.